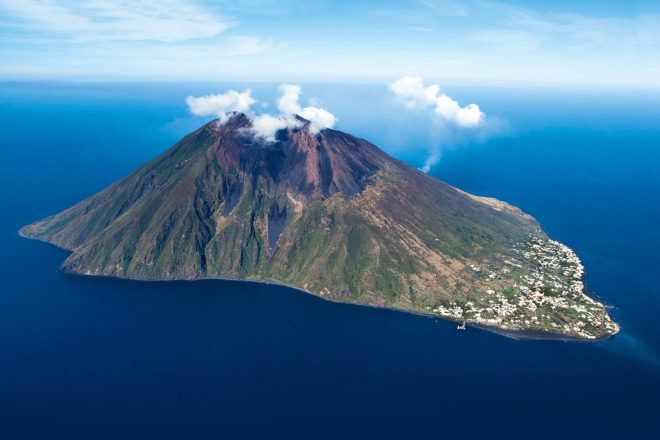 Stromboli in Italy, ranked #57 in our countdown of '100 Ultimate Travel Experiences of a Lifetime'. Ranked #57 in our countdown of ‘100 Ultimate Travel Experiences of a Lifetime’. Sitting at the outer reaches of the Aeolian Islands in the Tyrrhenian Sea, Stromboli is not so much an island as an active volcano (which has erupted almost constantly for 2000 years) with luxe stays and brilliant restaurants dotted at its base. The five-hour hike starts at a leisurely pace but things get a lot more challenging the higher you climb. By the time the summit is conquered the pitch-black night sky provides the perfect backdrop for the violent beauty of the lava spewing from the crater. The journey back down is exhilarating as you slide through pumice dust with only the stars to punctuate the blackness. Finish the adventure with a debrief and an ice-cold Limoncello shot. For more on Italy, visit expedia.com.au.